A very interesting comedy about three sisters and their relationships with some strange and quirky men. 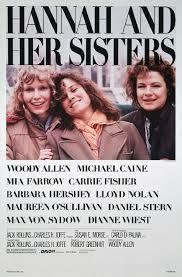 Hannah And Her Sisters is one of the better Woody Allen movies from the early stage of his career. It is a movie that comes from the time when he was making his strongest comedies (Late seventies through the eighties). He was not fishing for plots about criminals digging underground for a robbery (Small Time Crooks), or fortune tells putting curses on people, (The Curse Of The Jade Scorpion). He was not even making a movie about murder (Crimes And Misdemeanors and the Manhattan murder mystery). Instead, he was making a movie about relationships. A movie that was completely realistic, (save for a number of coincidences). 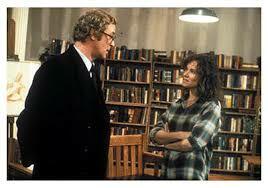 Almost as strong as Allen’s best work, the entirely realistic and quirky Annie hall. Hannah and her sisters are about three sisters and the men they have relationships with. There is Hannah, played by Mia Farrow, and her husband, Elliot played by Michael Caine. In the very first scene of the movie they are at a party with the rest of their family members and we learn from Elliot’s voice over that he’s in love with Hannah’s younger sister, Lee, played by Barbara Hershey. We watch as she walks by him while he is in conversation with some people, and how he turns as she passes and his eyes follow her. We listen as his voice over tells us his thoughts in that moment and how he smells the air as she passes to get her scent. Aside from Hannah and Lee, there is a third sister, Holly, played by Diane Wiest. She is the middle sister and she used to be quite the rebel. She was a cocaine addict who never settled down or found the right career for her. She is in the catering business now, but is constantly asking Hannah to borrow money. As the movie goes on she begins to pursue a writing career increasingly and that becomes the source material for some great comedy when she writes a book that is based loosely on Hannah and Elliot’s life together. The heart of the movie is the Elliott and lee affair, but there are other male characters in the movie too, all thrown into the mix through romance. There is Max Von Sydow playing the older art professor lover of lee and then there is Woody Allen playing Hannah’s ex-husband. He ends up being a main character in the movie as he comes to see his and Hannah’s kids and then we start following him in his own storyline. The Woody Allen character, Mickey, is a hypochondriac who is told by his doctors that they might have found something bad and that they need him to come in for testing. This sets him off, now worrying more than usual because for once he thinks he has a legitimate reason to be worked up. Allen is up to his usual stuff here, playing the nervous, fast-talking worrier, but he does it so well. In addition, in his storyline we get flashbacks to how before Hannah he used to date holly. We watch some scenes of them going out to two different music venues on there one and only disastrous date. The Elliott – Lee story is handled very carefully, and that is a good thing because the movie really gets into the head of someone in this character’s situation. The voice over helps us understand what he is thinking, but aside from that, we watch his action as he stalks her apartment or runs around the block so that he can be walking the opposite way as her and make it look like he accidentally bumps into her in the street. The irony of all of this is that Woody Allen was married to Mia Farrow and really did leave her for her younger daughter. Allen understands the mischief of needing to be sneaky and planning carefully so that you are not caught. He gets the appeal of the thrill and he showed that again in his career when he made the movie match point. Only that movie ended up being about murder, whereas Hannah and her sisters never go into anything that would be hard to believe. The movie features other characters giving voice over is besides Elliot and that really helps. We get to hear from just about every one of the main characters and each one of them has some interesting ideas going on in his or her head. They all have strong opinions and uncertainty about what they are doing. There is a great littler plot, for example, where holly and her friend, April, both meet a charming man at the same time and end up sort of competing for him. There is nothing childish here, but more like they both go for a ride with him and then have to figure out whom he will drop off first. Naturally, they are both hoping it is the other one and we get to listen to holly’s voice over as the man makes his decision. Another trick that works well for this movie is providing black screen chapter headings throughout the movie that off one line of dialogue or a one-line summary about what the topic will be of the next scene or two. This works well to divide the movie up into what is essentially a series of short stories involving the same characters. Hannah And Her Sisters is a wonderful film. It is not always completely funny or tense, but there are plenty of scenes that are both and those scenes work perfectly. The movie is very smart to have a series of characters and follow their interactions with each other as well as their voice over is on their own. It has a very interesting plot and it breaks that plot up into little chapters that become a sort of game for the audience to get a preview of what will be coming up. After that, part of the fun is watching to see what that line of dialogue or topic heading meant. It is a great movie with some very strong story ideas.